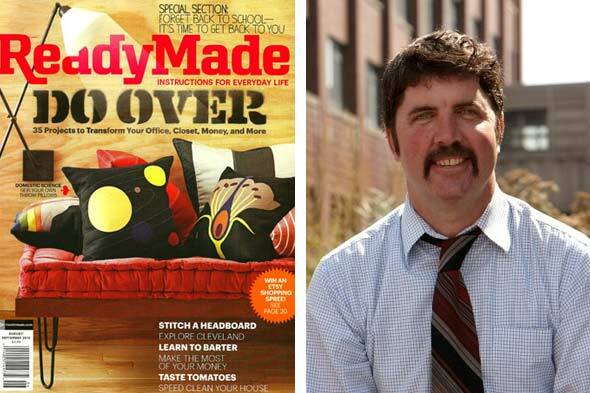 the now-former Editor in Chief of ReadyMade Magazine. -Did you subscribe to ReadyMade? -Are you cool with all the mags that are closing shop? -Do you still look to them for inspiration & ideas? -OR, are you getting your info on-line/blogs/etc...? So, we're all dying to know: What are your thoughts on the ReadyMade closing? "I've always thought of ReadyMade as the most successful zine of all time. It was a real passion project from the very beginning. But the goals of a niche publication like ReadyMade and that of a major publishing house like Meredith don't always align. Small, developing brands like ReadyMade are in constant need of in-depth attention from all those working on it but large publishing houses aren't necessarily set up to run in that fashion. This is neither good nor bad, just really unfortunate in these circumstances." Do you think ReadyMade was shuttered in the end because the audience was younger and were less inclined to pick up a print magazine? "I think there is definitely still a place for print amongst all age groups and ReadyMade's growth (from 125,000 circulation in 2006 to 335,000 in 2011) points to that. But publishing is, very simply put, a tough business particularly today. Magazines are dependent not only on reader support but advertising support. Today magazines are no longer competing just against other titles for readers and advertising dollars but also against all the quickly developing brands online not to mention television, movies etc. Magazines are in a particularly tough position because they are trying to put out a print product while simultaneously producing top notch websites, video channels etc. All of this needs to happen without necessarily more resources. So, essentially, I think there is a place for print even with a younger demographic but the competition is that much more fierce and you either are willing to play that game and dedicate your resources to that or you aren't and unfortunately in this case, resources needed to be directed to other places." Speaking of the web, was there any reasoning behind shuttering the ReadyMade website in addition to the print title? "I think at this point in time it was just determined that there was not enough money to be made online to support the type of quality product that we wanted to deliver online. I would love to see the site stay open - I really believe it is a hugely valuable resource. Several sources have approached me with a real interest in buying Readymade.com and I think there could be a real possibility that it will stay alive. I would love to see that." I saw a comment on your Editor's Letter that blamed the DIY audience, namely that ReadyMade encouraged them to recycle/not to buy things, for the magazine's closing. What is your response to that? "There's a misconception amongst many that the DIY audience is one that's 100% anti-consumerism, anti-establishment, and so on. Of course there are some people that are completely off the grid but there are far more who are completely involved in mainstream society - and those that are are precisely the consumers advertisers are looking for - smart, trend setting, highly engaged individuals. The DIY audience does, say, go to Target, will go buy a car, etc. But what makes the DIY audience different than a general mass audience is that they want to know more about a product before buying it. They ask questions. They want to know the back-story. How are things put together? Where do they come from? They really want to be a part of whatever it is they are buying. Again, they are an extremely engaged, opinionated consumer. Frankly, I think that's what the world needs much much more of." What can this mean for other titles? Can we expect more of the closings that happened in 2008-on across the shelter market? "It depends on the title and the business model behind it. Niche titles who take a niche approach to their business seem to be faring well. I helped start Dwell magazine in 2000 and though they are going through similar issues all publications are they are weathering the storm. I think Dwell succeeds for two reasons: One, that they have a staff of 30+ - each of whose mission is to grow that brand. ReadyMade had a dedicated staff of 10. Second, is that they are a privately-owned company. While it's in their best interest to grow the title and growth is what every brand is looking for, they do not have to constantly worry about the stockholders or board of directors, who are concerned-for good reason--about making a return on their investment. The Dwell backers are true believers in the product that is Dwell. ReadyMade obviously had its supporters at Meredith but in the end, it's a game of dollars and cents at a publicly traded publishing company." So, did you subscribe to ReadyMade? I am a designer and a DIY enthusiast. I used to subscribe to ReadyMade but to be honest, I never really connected to this magazine. The other magazine mentioned, Dwell, is more enticing to me. However, I really prefer more traditional or eccelectic interiors. I also live in a coastal community and must embrace coastal style. Publications I refer to are Traditional Home, Southern Living, House Beautiful, Arc. Digest, Florida Digest, Coastal Living. I love print magazines as they are easier to reference. I hope they never pass away. Like Anon above, I never connected with ReadyMade either. But I love shelter mags, generally. Sadly, the ones I really liked are gone. I adored Cottage Living and was particularly sad to see that one have such a short life. Some pubs are a little insane. I can't relate to designers who use – and homeowners who can afford – ridiculously priced pieces. I seem to remember seeing a bench that was captioned as costing $8,000. What? I check out blogs, but I prefer magazines. Always will. I like the experience of them, the portability of them. I like tearsheets. My design file is comically huge. But I keep adding to it. Though not as much as I used to because so many titles are gone. purchase vie subscription as cost of handling is usually 'an ouch'.